ABC has officially picked-up Flash Forward for a 13 episode order. The Hollywood Reporter has broken the news. This is very good news as most 1 hour series only get picked up for 6 episodes to start. 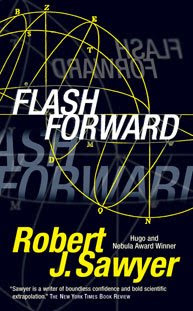 The series will be based on the wonderful book Flashforward by Robert J. Sawyer. If you've never read Sawyer before so yourself a favor and pick-up Flashforward or Calculating God. There is no one better at Sci-Fi today. The series is talked about to follow Lost although it is very different other than both shows deal with time anomalies. Flash Forward takes place after a global incident in which every waking person blacks out and flashes on where they will be in 6 months for less than 3 minutes. This is a little different than the book in that people flash about 20 years in the future instead, but regardless it is a great premise and is rife for exploiting different character view points through out the world. If you knew what was going to happen to you would you try to change it or doing everything you can to keep it? Would trying to keep your supposed future change the very outcome?